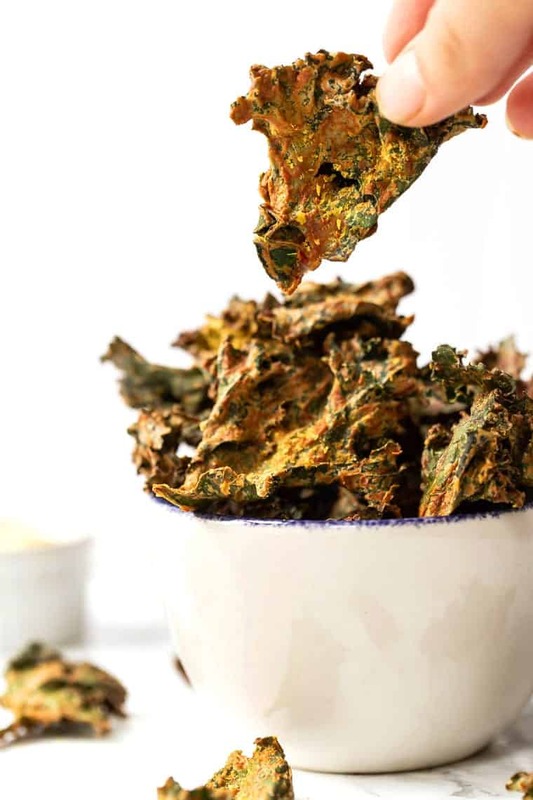 How to make cheesy kale chips. 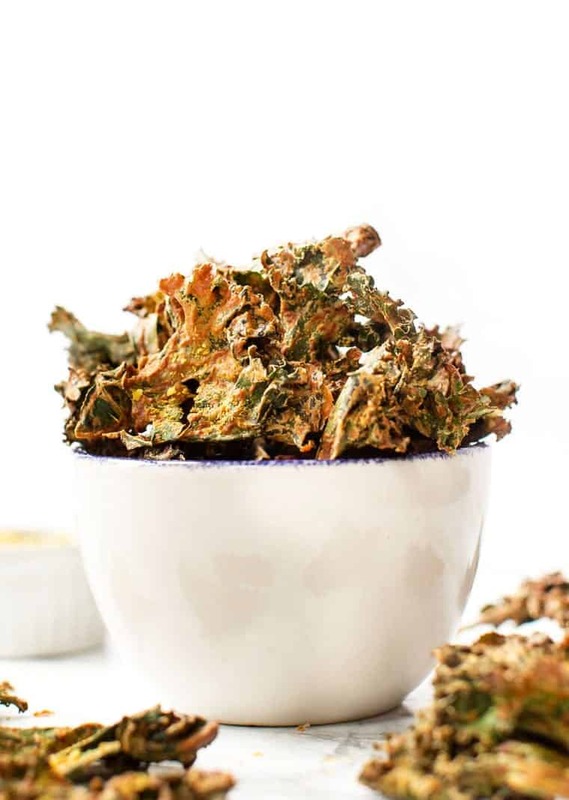 These vegan baked kale chips that are tossed with a delicious nutritional yeast queso. High protein and full of healthy fats! I have a major weakness for chips. If I'm near a bowl or bag of chips, I consistently will eat at least 3 servings. I love the crunch and I love the salt. But inevitably, I always end up with a stomach ache. For starters, chips are deep fried which means they're cooked in oil. And because companies try to keep costs down as much as possible, more often than not the oil is a really low-quality one. Low-quality oils = gastro issues for me! A solution that I've found, that both satisfies my love for chips, but doesn't leave me farting for the rest of the day, are kale chips. They're healthy, they're easy on the system and they're super tasty. Only problem? They're hella expensive! Why Are Kale Chips So Expensive? After trying multiple brands and looking at the ingredient labels, I realized that most of these cheesy kale chips I'm eating are actually make with ingredients that I already have on hand. Cashews, veggies, spices. Pretty standard pantry items. So why are they so darn expensive? Food costs obviously depend on a lot of factors. There's the cost of the actual ingredients, the labor costs to produce it, the packaging etc. And for kale chips, I think the two main factors are the food costs and labor costs. The ingredients for most kale chips are a base of raw cashews and nutritional yeast, both of which are pretty pricey. 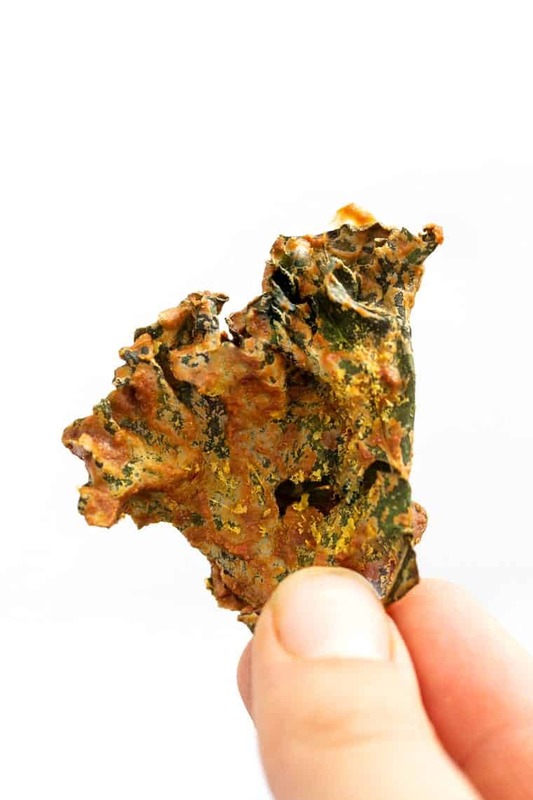 To top it off, kale chips are usually labeled as raw, which means in order to get them crispy they are dehydrated and that takes a looooong time. So we've got expensive ingredients + a long production process = $7 for a mini bag of kale chips! My favorite thing about kale chips is how crunchy and cheesy they taste. The secret to getting that? Vegan queso sauce and time. We start by whipping up our nacho cheese sauce. The base is raw cashews that get soaked for a few hours so they can get easily blended. Then we blend that up with a little nutritional yeast (that classic cheesy flavor), some red bell pepper for a little sweetness and spices for an extra punch. Seriously I could eat this stuff all day long! This recipe usually yields a little extra sauce, so store that stuff for dipping with your cheesy kale chips or to drizzle on top of tacos. SO GOOD! And then we just simply toss that all together with our raw kale, make sure everything is nice and coated and then bake it low and slow. 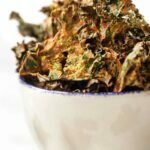 Since I know most people probably don't own a dehydrator, I wanted to share a method that makes super crispy baked kale chips that aren't burned. The only thing is you want your oven low and you need to let them bake slowly. This helps to pull out all the moisture without overcooking them. Kale is a very delicate green when it's cooked, so as it gets heated, it can burn really quickly. That's why you want to keep your oven around 200-225ºF. If you do have a dehydrator, I also included instructions for that as well! 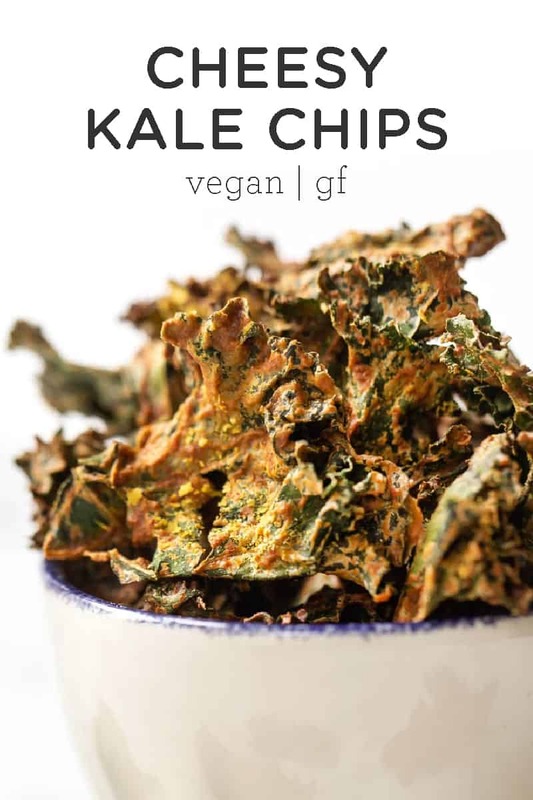 Super Cheesy Kale Chips…That Are Vegan! That's right, we've smother our kale chips in vegan queso, baked them up until crispy perfection and let me just say…these make a pretty darn amazing snack! They'll satisfy your desire for crunch and they're actually satisfying to your hunger levels as well. Since we're using cashews and nutritional yeast, we're getting both healthy fats and protein, plus all the minerals from kale. We've got 9g of protein and 12g of healthy fats PER serving! So if you're a savory snacker, you gotta try our version of cheesy kale chips. 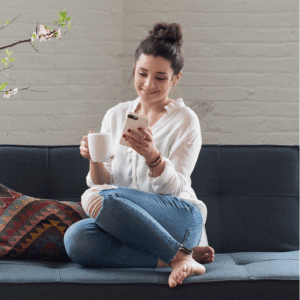 Now you'll never have to buy a $7 bag of kale again! These cheesy kale chips are tossed in a vegan nacho sauce then baked to perfection. They're easy, healthy and SO delicious! 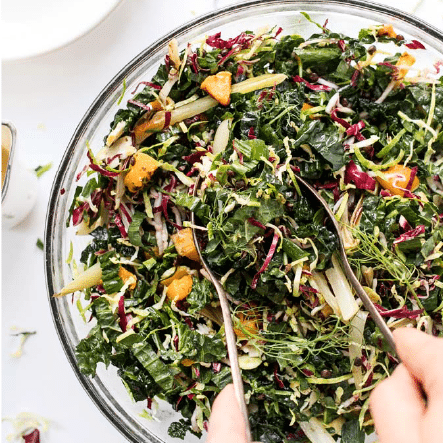 Add the kale to a very large mixing bowl (or separate into two if you don't have one large enough - you need to be able to toss it around). 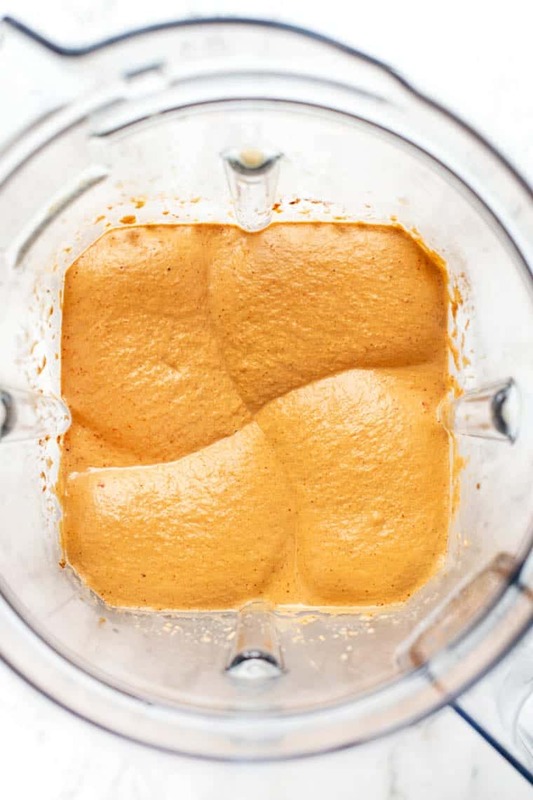 Add the remaining ingredients to a blender (or food processor) and blend until smooth. Pour the 'cheese' sauce over the kale and mix with your hands until the leaves are covered. 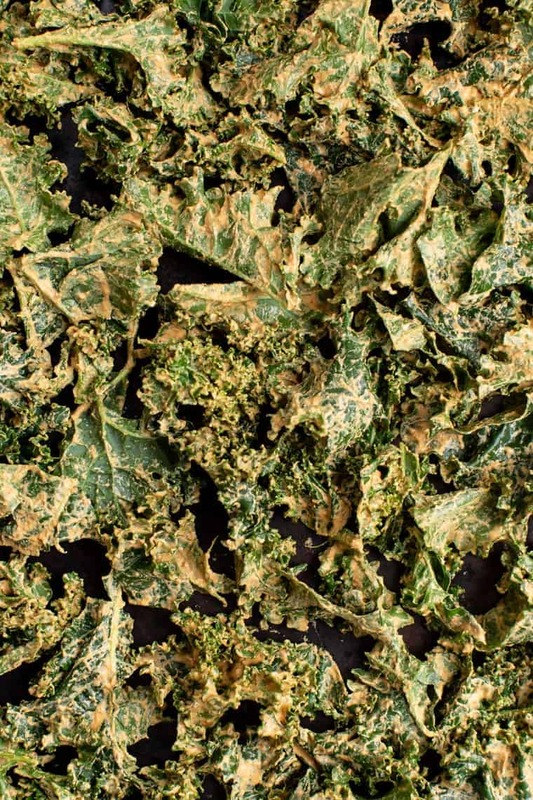 If you have a dehydrator, arrange the kale chips in your dehydrator and dehydrate at 120ºF for 12 - 14 hours, until crispy. If not, heat your oven to 225ºF. Spread the kale on two baking sheets trying to not overlap as much as possible. Bake for 90 minutes, flipping halfway through (and swapping your pans on the racks). Allow chips to completely cool before storing in a sealed container or bag. They must be TOTALLY cooled or they won't stay crispy! I made these last night in my dehydrator. I woke up to a delicious chip! The addition of cashews is perfect! I used half of the chili powder and none of the cayenne, but they are still very spicy. I can’t imagine how hot they’d be if I used it all! I’d cut it even further next time. I can’t wait to make these again! Yay! This turned out perfectly and the taste is awesome! Can’t wait to try another recipe. Can you substitute macadamia nuts for the cashews. I’m allergic to every nut but macadamia. Thanks this look delicious. I actually think it could be!